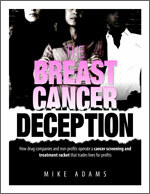 Overall, the cancer industry, through its false authority and domineering posture, has not only discredited all systems of medicine other than its own, it has long succeeded in outlawing most competing systems, transforming experienced herbalists (who retain the knowledge of countless generations of native medicinal wisdom) into criminals. This is why all the cutting-edge cancer clinics in the world are located outside the United States. The practice of curing cancer -- a common outcome in alternative cancer clinics -- has been outlawed in the United States. It is actually illegal for a master herbalist, for example, to even attempt to cure a patient of cancer. Such an act could land them in federal prison. This strategy by the cancer industry effectively keeps women in a state of ignorance about cancer solutions that could actually cure them. It disempowers women, turning them into victims of treatments dictated to them by men who, as CEOs of the top cancer institutions and drug companies, profit handsomely from every round of chemotherapy, radiation or cancer surgery prescribed to a woman. Because of all this, the symbol of the breast cancer industry in the United States -- the pink ribbon -- is not at all a symbol of compassion or caring. It is not a symbol of empowering women, or educating women about so-called "treatment options." The pink ribbon is a symbol of male-dominated control over women. Turn the pink ribbon upside down, and it looks more like a noose. It is from this noose that innocent women everywhere hang themselves through ignorance, submitting to a treatment system that intentionally denies women access to a world of information that could help them prevent, treat and even cure breast cancer. Chemotherapy, you'll soon learn, actually causes heart failure, brain damage and permanent kidney damage. Submitting to conventional chemo treatments for breast cancer makes you a patient for life due to all the organ problems you're likely to experience as a result of the chemo.